I like to create little experiments on Codepen.io and I get a lot of questions about how I made certain elements or effects. In a series of "behind the scenes" I try to dissect a few interesting pens. In this first episode I'll show you how I made the CSS-only clock with the single element clock face. We can break apart this pen in three parts: the clock face with it's complicated background rule, the clock hands and the CSS animations that power the clock hands. The clock face is one single element with a complex set of background rules that form the hour and minute marks. The hands are a simple set of three div's (one with an extra pseudo class to form the red circle). And the animations look difficult, but the concept is really simple. 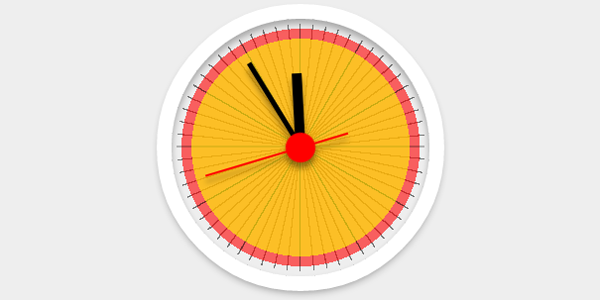 The clock face is made up by a background color, a few box shadows and a complex backgorund image definition. It looks really complex, but once you grasp the concept it is really simple. It just needs a lot of code. The margin places the element in the middle of the page, 35 pixels from the top. We need this offset to get a little distance, but also to compensate for the box shadow which creates the white ring around the clock. The clock has a 260 pixel diameter, and the border-radius of 50% makes the element round, regardless of the size you enter. Now on to the hardest part of this pen, the stacked background images that form the minute and hour marks on the clock face. First there's this grey background, then a lot of lines, then the red radial gradient, then some more line and at last the orange overlay to cover everything again. This leaves us with the illusion of the short lines as minute and hour marks. It starts transparent until 49,5% of the image, then from 49,5% to 50% it's black, and from 50% onwards it's transparent again. This creates a thin line in the middle of the transparent background. If you'd like thicker marks you'll need to make the black part bigger, for example from 49% to 51%, but remember to always have 50% as middle. For example if you'd want a really thick line of 10%, you'll need to define it from 45% to 55%, not from 40% to 50%, because the background images are rotated around there own centers. The "96deg" definition rotates the "base line" of the image to 96 degrees. Every following line in the clock face is the same, but has another angle. The minute marks increase by 6 degrees, and the hour marks increase with 30% each. This creates a radial gradient that's a solid color (#EEE) until 120px and fades from this color to transparent at 120 pixels. Since these numbers are the same, the "gradient" will be instant and thus create a solid circle with a 120 pixel diameter. If tou'd like the hour and minute marks to be bigger, you need to make this overlay circle smaller. The left: 50% rule places the element in the middle of the clock face, but it aligns it on the left edge of the div and thereby it's just off-centre. Therefor you need to set it back half it's own width and to do that we use the negative margin rule. The hand is 5 pixels wide, so it needs to be set back 2,5 pixels to be exactly aligned in the middle. And yes, you can use decimals in pixel definitions. Every hand has a transform-origin set to 50% (x) 100% (y) to let the hands rotate around their own bottom centers. Default transform origin is 0% 0% for all elements and if you don't change that the hands will rotate around their left top corners. Next are a few exceptions to make the hour hand thicker and the second hand thinner and with a little offset to create the "tail" of the red hand. The seconds hand has an offset of 35 pixels, so this circle had to be set back 35 pixels to be in the center of the rotation point again. Every hand in the clock has an animation set that rotates the element 360 degrees in a certain timespan. The second hand makes a full rotation in 60 seconds, the minute hands fully rotates in an hour (3600 seconds) and the hour hand rotates in 12 hours (43.200 seconds). The animations are the same, the only difference for each hand is the duration of the animation. arr1, arr2 and arr3 are the names of the keyframe animations (set in the remote PHP file) and the rest is the time (43200s), animation easing (no easing: linear) and the number of times the animation should be repeated (infinite). If you want a clock hand to start at the top at 12 o'clock and make a full circle, you'd start the animation at 0 degrees and rotate to 360 degrees. But since you want to start the clock at the current time, you need to skip forward and start the rotation at the current time, converted into the correct amount of degrees and let it run to that number, plus 360 degrees, to let it make a full turn. There is no limit in the amount of degrees you enter in a transform-rotate rule. Another solution for this time-setting-issue would be to define one keyframe animation that starts at 0 degrees and ends at 360 degrees and set a negative animation-delay for each clock hand. The animation-delay function can be used to delay an animation, but also to skip ahead to a certain point in an animation. If you set an animation delay of 2 seconds to a 10 second animation, it will start after 2 seconds and end after 12 seconds. If you set an animation delay of -4 seconds on the same animation, it will start immediately, fast-forwarded to the 4 second keyframe and stop after 6 seconds. This trick is very useful in situations like this. wow! Cool work. I really like it, thank you.